Do you ever change your mind/go a different direction when it comes to design decisions? Or are you the type that once something's there, it's there for good? I think maybe that was the mentality of my parents' generation--you only upgrade every 30 years or so...that's why we still have houses that look like the last time anything was touched was back when the Dukes of Hazard was "the show." Well I definitely don't fall in the "we put that in three years ago so don't even think about changing it" category. Case in point, we've lived in our home almost seven years now and my living room has been painted three times (all with its own unique style), and every other room (excluding the master--which is almost due for a color change) has been painted twice now. I like mixin' it up, what can I say? And I kind of justify these switcheroos because not much money is spent completing the change up. So you know how we just (almost) finished our kitchen a year ago? Well the official "call to the bullpen" has been made with regards to a light that was installed less than one year ago. Let me break it down for ya. 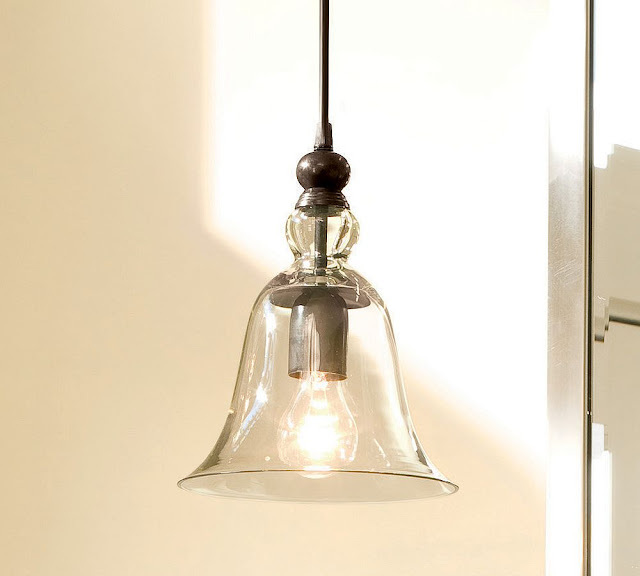 So a couple years ago, I spotted this pendant in the Pottery Barn catalog and fell in love. Long story short, I bought one at the PB outlet for like $20. I finally had my dream pendant! But then there was a problem: I started seeing MY dream pendant on other blogs and I didn't like it.one.bit. I like to think that I have my own unique style--I didn't appreciate the fact that just anybody could order this light out of a catalog and replicate my style (I know--dumb. Call it my Phoebe-istic ways.) So while I thought it looked nice, I just wasn't 100% happy with my decision to hang it in a prominent location over my sink. Fast forward to yesterday: the best things come when you're not looking for them, don't they? That's why I'm a big proponent of buying what you love when you see it. (Within reason, of course) It doesn't really matter (to me) that you don't have a specific use for the item or spot to put it right that second, just get it--and if you love it, you'll find a use for it someday. Well as I was walking around the thrift store yesterday, I came across this light. It was love at first sight. Vintage, industrial looking heat lamp. Yeah, I guess this light used to keep chickens warm?? Who knows. But one thing I DO know is that it's now in my kitchen. So much more character. And I love the soft light cascading down. I must give a shout out to my father-in-law who hardwired this bad boy for me and rigged it into a pendant all within hours of my purchasing it. Thanks, Jimbo. So for $5 and a little bit of tweaking, I've added that uniqueness that I'm all about. Well if the heat goes out you can always use the kitchen light to heat the house! I'm a changer-outter too. The bedding in my SIL's bedroom at the inlaws is the same stuff she has had since she was 13 and they have moved houses 3 times but kept the same bedding. Now she is 33! I've changed bedding 3 times in the past 2 years. That is an incredible find! I absolutely love it. Girl...I don't know what to say. Except dang, that's a good lookin' lamp! Also, are we the same person? Your posts echo what goes on my head a lot. I've said it before, but I'll say it again, I LOOOOOOVE your kitchen. Awesome.... what an amazing find and it is perfect right over your sink! Holy light fixtures! I love it!